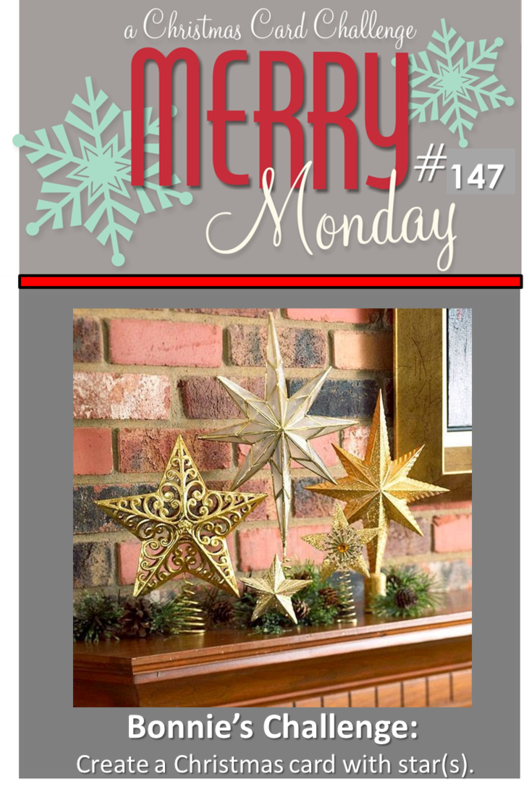 We're "seeing Stars" this week at the Merry Monday Christmas Card challenge blog! Bonnie invites us to create a Christmas card with - you go it - Stars!! Stars are actually a shape I have lots of - different kinds and sizes. It was hard to choose. I settled on this bow/star die from Memory Box, which I just love. I used My Favorite Things Jumbo Abstract Art for the watercolor splashes for the background using SU colors Wisteria Wonder and Soft Sky. The sentiment is Stampin Up (but don't remember from which set as I have a box of Christmas sentiments I pick from). Looking forward to seeing YOUR stars shine this week!! Check out the Design Team's wonderful projects which I know will give you tons of inspiration! Gorgeous! LOVING the colors and the stars!!!!!!!!!!! Wonderfully creative Kathy, I love the colours and sentiment you used. Oh, so gorgeous! I have this MFT set, now I'll have to get it out and play with it. 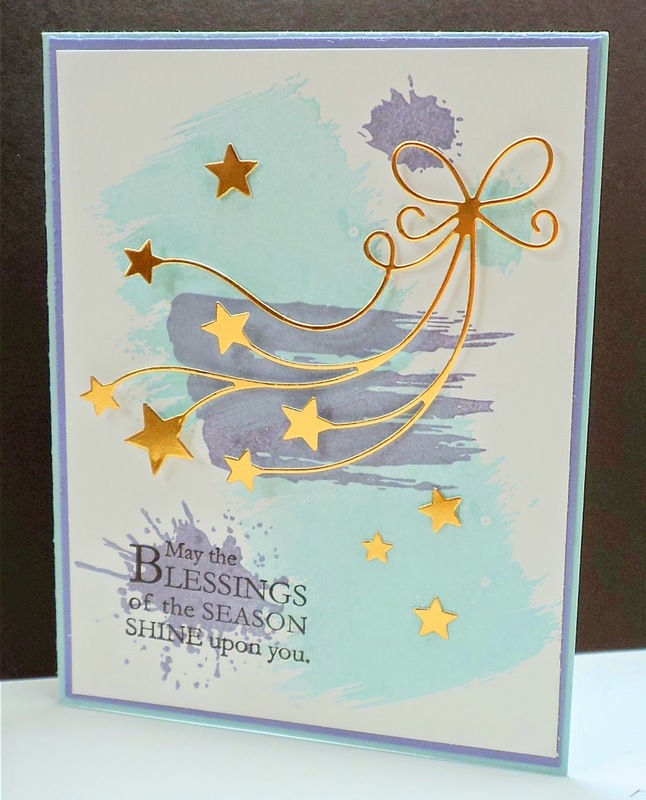 Just love your gold die cuts/stars over those blue shades! Really inspiring! Oh my goodness Kathy this is wonderful! 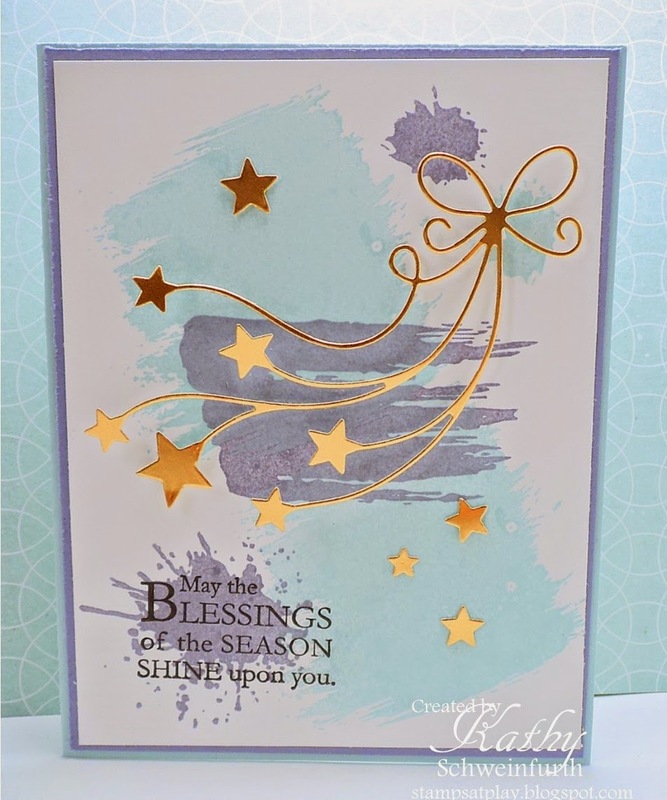 I LOVE that bow/star die and it is amazing cut from gold!! Love, love, love these stars tied with a bow! Great background and the perfect sentiment! Have a great week, Kathy! Wowzers - love the motion on your wonderful card! I just LOVE that cute little sentiment to go with the stars! LOVE those colours with the gold - perfect!!! What a fabulous combination of products! The star die looks so good with the art splashes in the background. Gorgeous! I love your background stamping/colors and the gold stars are perfect! Have a great week! I love the die over the watercolor background. It gives it so much movement and interest. I love the angelic feel...so sweet! Wonderfully thought out and designed card. I can just hear the twinkling of the start as they waft on a breeze. I love your colours and the moving element in your stars . Great card !